My PhD student Oded Papish and I studied the flow structure in the jittering-jets explosion model of core-collapse supernovae (CCSNe) using 2.5D hydrodynamical simulations. We find that some basic requirements for explosion are met by the flow. In the jittering-jets model jets are launched by intermittent accretion disk around the newly born neutron star and in stochastic directions. They deposit their kinetic energy inside the collapsing core and induce explosion by ejecting the outer core. The accretion and launching of jets is operated by a feedback mechanism: when the jets manage to eject the core, the accretion stops. No energy deposited by neutrino is required. We find our results to strengthen the jittering-jets model as explosion mechanism for all CCSNe. 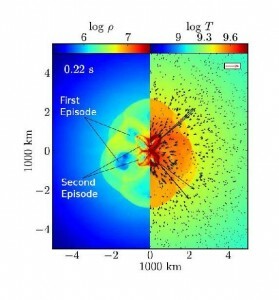 The paper “Exploding core-collapse Supernovae by jets-driven feedback mechanism” is published by the Monthly Notices of the Royal Astronomical Society. The Asymmetrical Planetary Nebula 6 (APN VI) meeting was held in Mexico, November 2013. The first meeting in this series took place in Oranim College in Israel, summer 1994. The talks and discussions of the meting are on Youtube. One of the points I raised there (a one-minute video) is that sometimes the prediction of a model is so simple and clear, that it is simply ignored. Such is the prediction of the binary-model for the formation of bipolar nebulae. The prediction is that bipolar nebulae are formed by binary interaction, and hence binary system exists (unless it merged) within the bipolar nebula. This was the case with Eta Carinae, as I discussed there. We (Noam Soker, Enrique Garcia-Berro, and Leandro G. Althaus) argue that the properties of the Type Ia supernova SN 2011fe can be best explained within the frame of the core-degenerate (CD) scenario. More: In the CD scenario a white dwarf (WD) merges with the core of an asymptotic giant branch (AGB) star and forms a rapidly rotating WD, with a mass close to and above the critical mass for explosion. Rapid rotation prevents immediate collapse and/or explosion. Spinning down over a time of 0-10 billion year brings the WD to explosion. A very long delayed explosion to post-crystallization phase, which lasts for about 2 billion years leads to the formation of a highly carbon-enriched outer layer. This can account for the carbon-rich composition of the fastest-moving ejecta of SN 2011fe. In reaching the conclusion that the CD scenario best explains the observed properties of SN 2011fe we consider both its specific properties, like a very compact exploding object and carbon rich composition of the fastest-moving ejecta, and the general properties of SNe Ia. The full paper is here. There is an ongoing debate regarding the nature of the SN impostor SN 2009ip and the several outbursts that followed its 2009 eruption (see post below from December 2012). Most controversial is the nature of the 2012b outburst, with three main types of scenarios: SN explosion, non-terminal single star eruption, and a binary interaction. Recently we further developed the binary model. In Tsebrenko & Soker (2013) we show that high-velocity ejecta with 10,000 km/s in the outbursts of the 2009ip and similar luminous blue variable (LBV) stars can be explained by the interaction of fast jets, having velocity of 2000-3000 km/s, with a circumbinary shell (extended envelope). In Kashi, Soker & Moskovitz (2013) we propose that the major 2012b outburst of the supernova impostor SN 2009ip was powered by an extended and repeated interaction between the Luminous Blue Variable (LBV) and a more compact companion. Summary talk of the ESO meeting “The death of stars and lives of galaxies“, April 8-12, 2013. I gave the Summary talk of the meeting, emphasizing the role of angular momentum at the final stages of stellar evolution. Eran Ofek and collaborators reported that this core collapse supernova had an outburst one month before explosion. 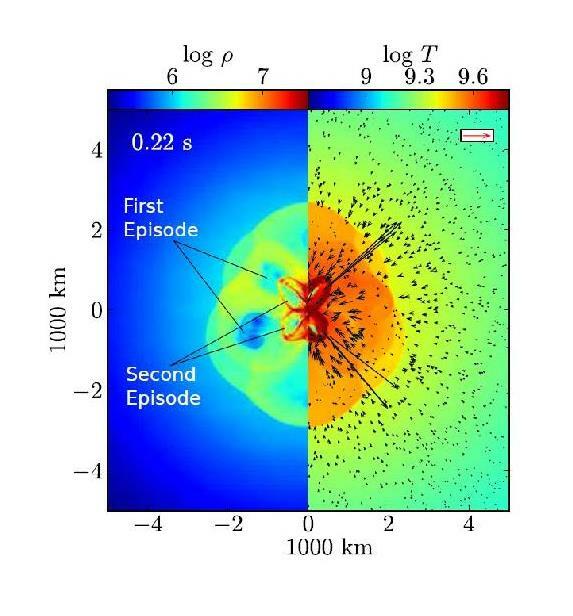 The total energy (kinetic energy of the ejected mass and radiation) and duration of the pre-explosion outburst (PEO) are similar to several other outbursts that are termed Intermediate Luminosity Optical Transients (ILOT). See this updated Energy-Time Diagram. I suggest that the PEO was energized by gravitational energy released by mass accreted onto an O star main sequence companion. The source of the mass is the envelope of the primary star (the one that exploded) that experienced a rapid expansion before explosion. The expansion was triggered by the powerful nuclear burning of oxygen in the core in moths before explosion. This star erupted in 2009. It was thought at first to be a supernova, hence the name SN 2009ip. However, it erupted few times since then. In September 2012 it went through a major outburst, proposed to be a supernova by some researchers. We, Soker & Kashi (2012), proposed instead that the major outburst was actually a merger of two very massive stars. A short popular summary of this idea was published in New Scientist.